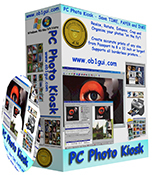 PC Photo Kiosk Description: Process your digital photos in the comfort of your own home. Just like Photo Lab or Drug Store Kiosks, your first step is to select your images for printing. 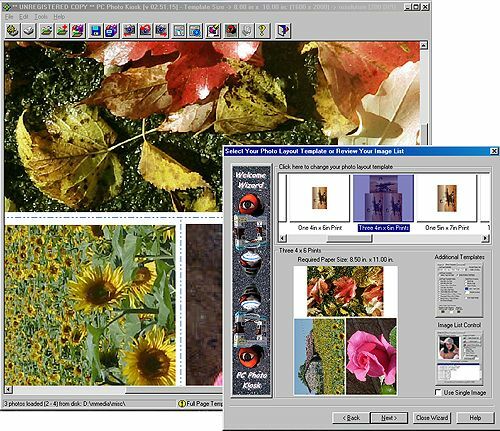 Once an image list is selected, the popup photo layout dialog gives you complete control over image selection, templates and filters using the built-in property sheet controls. You save MONEY, INK and TIME! 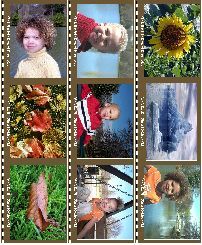 Text or Image Watermark - protect your photos using any text or transparent image logo. Built-in photo templates - dozens of built-in templates in either half page or full page for your selection. All standard photo print sizes supported including user selectable. Multiple image filters - grayscale, negative, emboss, brightness, contrast etc. User configurable image lists - unlimited sizes and all popular file types such as BMP, PCX, TGA, TIFF, JPG, PNG etc. Automatic Batch Print Operation - ANY series of templates selected in PC Photo Kiosk can be used to instantly create a batch operation. Print your entire photo list with one keystroke. No complex scripts or programming sequences are needed. Simply point and click! 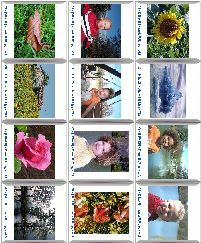 Automatic Contact Sheet Generation - Simply select the index sheet template, select your image directory and watch PC Photo Kiosk instantly create contact sheets. Built-in Electronic Photo Album - create, organize and display your own personal photo albums. Select photos from anywhere on your computer and combine them into themes and album styles. Image Browsing and Viewing - As an image viewer, PC Photo Kiosk quickly and efficiently can stretch or compress your images while constantly maintaining the aspect ratio of each image. Copyright © 2002 - 2007 Ob1gui, Inc. All rights reserved.